Recently, I bought a book, ‘Cupcakes from the Primrose Bakery’. It is an enchanting book that made me want to try every single combination that they have! But it will take me forever. So despite the hard decisions, I decided to make Strawberries and cream & Chocolate with coffee buttercream cupcakes. They are for a picnic so I thought those 2 type of cupcakes suited for the occasion. Strawberries are so cheap because it is close to summer time here and with a mocha hit, it would make everyone happy. I made this cupcakes in a food processor but you can still use an electric hand mixer. Preheat oven to 160°C. Line the muffin tray with appropriate size cupcake cases. Put sugar, flour, baking powder, cornflour and crushed strawberries into a food processor. Pulse until evenly mixed (roughly 4 seconds). Add the butter and eggs and process briefly until even (roughly 10 seconds). If you are using an electric hand mixer, cream butter and sugar together first, beat in eggs one at a time, and then add remaining ingredients and beat well together. 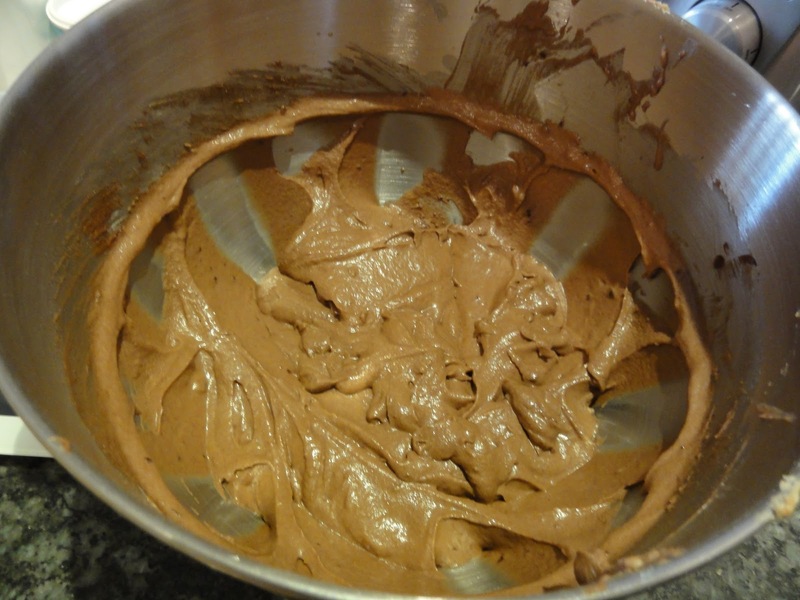 Carefully spoon the mixture into the cupcakes cases, filling them to about two-thirds full. Bake in the oven for about 25 minutes (I recommend checking at 20 minutes as my oven seems to be quite hot). The cases will be fairly moist even when cooked. In the meantime, make the vanilla icing. This is a fairly simple vanilla buttercream icing. Beat butter, milk, vanilla extract and half the icing sugar until smooth – this takes several minutes with electric mixer. Gradually add the rest of icing sugar and beat again until the buttercream is smooth and creamy. Remove from oven and leave the cakes to cool in their tins for about 10 minutes before carefully placing on a wire rack to cool. 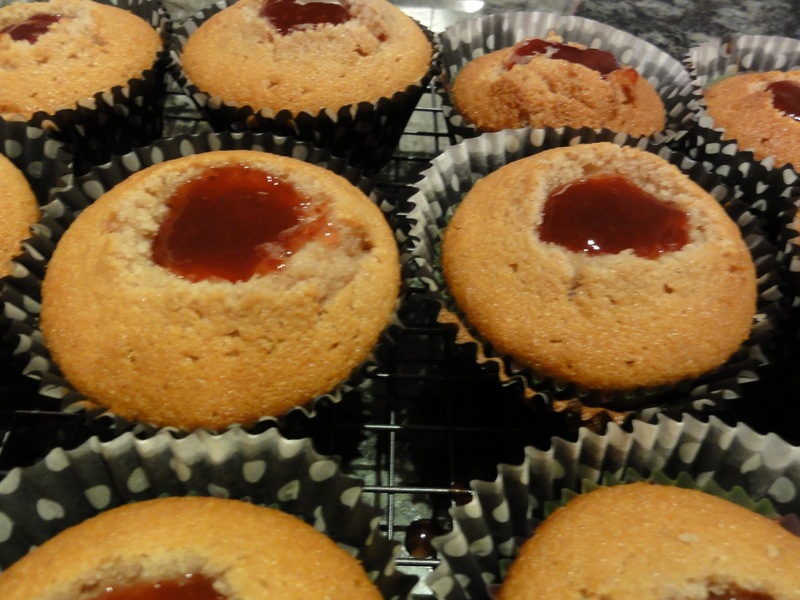 Once they are completely cool, carefully make a small hole in the centre of each cupcake and use a teaspoon to push the strawberry jam into the hole – you can slightly warm the jam in the saucepan first to soften it before pushing it into the sponge. 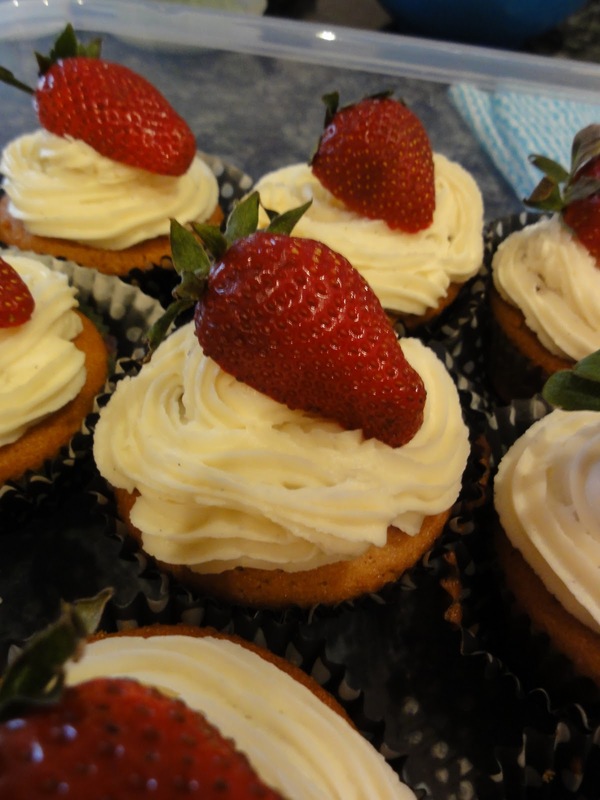 Wash the strawberries and allow them to dry off on kitchen paper to limit any excess water and juice spoiling the buttercream once they are on the cupcakes. Decorate the cupcakes with vanilla buttercream icing and, just before serving, place a fresh strawberry in the centre. Preheat oven to 170°C and line muffin trays with cupcake cases. Melt chocolate pieces in a heatproof bowl over a saucepan of barely simmering water. Stir occasionally until it has completely melted and is quite smooth. Leave to cool slightly. Cream butter and sugar until pale and smooth, takes about 3-5 minutes using electric mixer. Beat the egg yolks with a clean beaters in a separate bowl for several minutes. Slowly add the egg yolks to the butter mixture and beat well. Next, add the melted chocolate to the mixture and beat well. Combine flour, baking powder and bicarbonate soda and salt in a separate bowl. Put the milk in a jug and add vanilla extract to it. Add one-third of flour to chocolate mixture and beat well. Pour in one-third of milk and beat again. Repeat these steps until all flour and milk have been added. In a clean bowl, whisk the egg whites until soft peaks start to foam. Carefully fold the egg whites into the batter. Do not beat as you will lose all the air in the egg whites. Carefully spoon mixture (fairly liquid batter) into the cases, filling about two-thirds full. Bake in oven for 20-25 minutes until skewer comes out clean when checked. 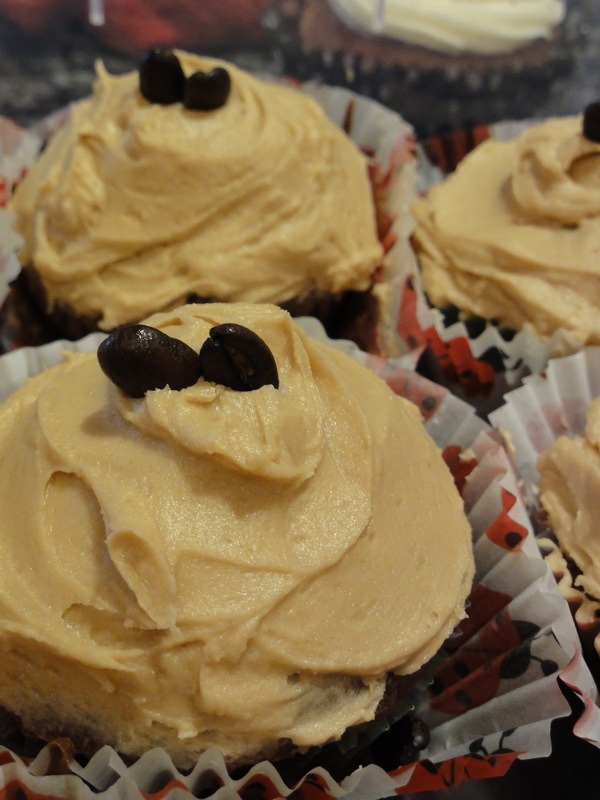 Once they are completely cool, ice the cupcakes with coffee buttercream. 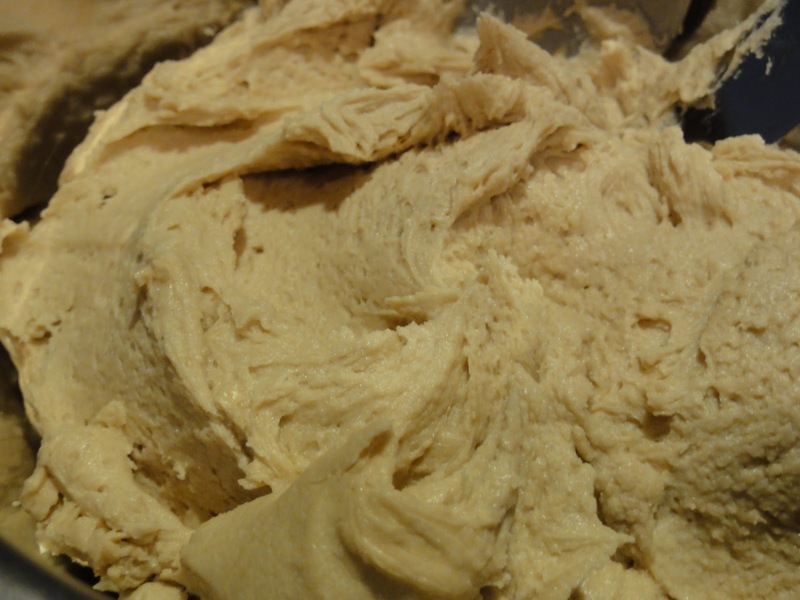 To make coffee buttercream icing, follow the same procedures as making vanilla cream icing. Beat butter, milk, espresso mixture and half of icing sugar until smooth – takes several minutes. Then add remainder of icing sugar gradually to produce a creamy and smooth consistency. These cupcakes can be stored at room temperature for 3 days in an airtight container before icing. They are very moist, so they keep very well if stored correctly. Both of the icing is quite sweet so if you do not have a sweet-tooth like me, reduce the sugar or slowly add the remaining sugar and taste the icing as you mix them. I always line the muffin trays with 2 cupcake cases, to add strength and hold the cupcake better.